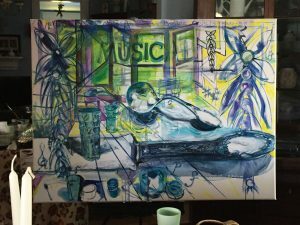 Here is the latest (In it’s natural habitat, the dining room;-) working title is ‘Music Room’; it is in it’s ‘late Adolescence’, and heading to ‘grown up’. This is the first ‘straight’ interior I have done in years; no people or animals just the room its’ space, light, time and artifacts. The setting is from the home of my youth and the items from there; things I saw from the time before I could read or rationalize. The space is cubistic. I am investigating memory, time and movement. Checking to see if any of my interior life and memory can be communicated to others visually. HA! We will see if that lofty goal is attainable.